Gulf Strike is the simulation, of current Islamic war in the Middle East. Russia and Iran are in opposition: the Ayatollah is determined to help his Islamic brethren in Afghanistan. The Soviet Union supports Iraq. The U.S. backs Iran. You command the U.S. Army, Air Force, Navy and Marine Corps. You can play the computer or a living opponent, and you can save games. Here is a game offering the intricacy of chess. A strategic battle between Order and Chaos is set on a board containing Fire, Water, Air, Earth and Void. As a mage, you can conjure 12 types of monsters. A second screen displays the battleground, where icons from each player's realm battle in fast, arcade-like fighting. Watch power levels as you conjure monsters and cast spells. Winning occurs when you occupy all six power points, when your opponent runs out of energy, or when you run out of icons. Each monster and spell requires a different level of energy to conjure. It's not hard to learn the basics, but the variety and strategic subtleties are extensive. This game offers appropriate sound that doesn't overpower the player. The graphics are sufficient to portray different monsters, movement and domains. Both parts of CBS' Adventures in Science Series, these games teach scientific thinking and fundamentals of ecology. T-Rex puts you in the role of a Tyrannosaurus Rex 70 million years ago. You must survive. This means controlling the dinosaur's movement, and maintaining levels of food, water and energy. The game is based on recent research, and includes four levels of play. The Honey Factory puts you in charge of finding locations of pollen and nectar. As a scout bee, you must move through the countryside, locate the food, and find your way back to the hive. At the hive, you assign tasks to worker bees and work to maintain social stability. The Zone Ranger is a rebel warrior commissioned by Earth in 2130 to explore uncharted regions of space. As the ranger, your goal is survival. There are 30 levels of difficulty filled with deadly drones, planetoids, and the mysterious Super Portal which causes you to enter absolute space vacuum. Zenji is an attempt to combine glowing graphics, the challenge of a maze, and the depth and philosophy of Zen Buddhism. Your joystick must connect various parts of a maze while avoiding the Flames of Desire and their illusions. 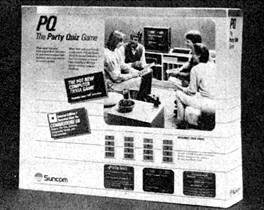 Up to four players or teams can compete in this 2,500-question trivia game. The price includes four hand-held controllers attached to four-foot cables; there is no need for players to crowd around one keyboard. You can choose the length of the game, the number of players (one to four), and the time allowed to answer a question. You can also handicap advanced players. This set includes two disks of expandable sound and graphics effects written in Atari BASIC for beginning and first-time programmers. According to Wiley, the effects can be used to create dramatic sound and light shows of music and pulsating graphics, as well as colorful computer games.